In a contemporary, yet classic survival story, The Martian documents the struggle of astronaut Mark Watney to withstand the barrage of life-ending threats thrown by Mars. Although science fiction, author Andy Weir weaves physics, astronomy, botany, engineering, and chemistry into the book. One of the topics Weir deftly describes is the challenge imposed by traveling to Mars. 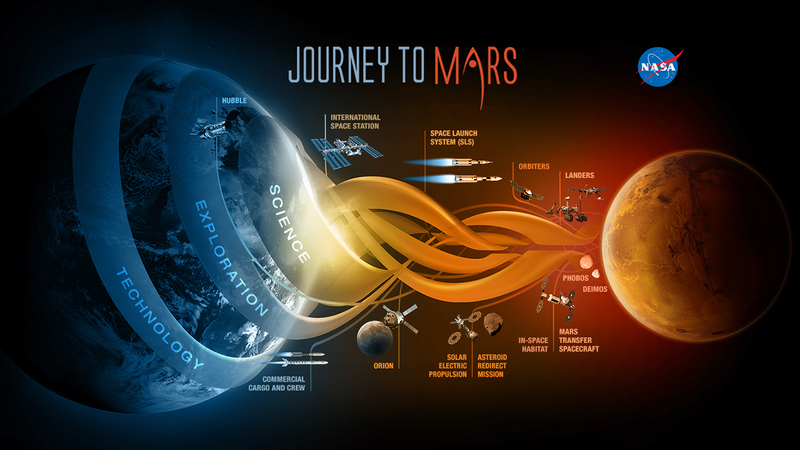 If you travel to Mars, there are three legs of your journey: (1) the launch from Earth; (2) the orbit around the Sun; and (3) the landing on Mars. During the launch and landing, you will use rocket fuel. But during the orbit, you will drift through space with Newton and the Sun driving. To reach Mars, the rocket must launch from Earth at just the right time, speed, and direction so your orbit around the Sun is on a collision course with Mars. This window of opportunity only comes around every 26 months, which is the time it takes for Mars, Earth, and the Sun to align (though you will certainly not travel in a straight line). If you miss your flight, you will have to wait 26 months for the next one! This simulation shows the 26 month interval between alignment of Earth, Mars, and the Sun. Click the scene to start. When Earth passes between Mars and the Sun, the simulation will stop. Click the scene to start it again and let it run until Earth again passes between Mars and the Sun. This shows you that whenever the best date of launch occurs, it will be 26 months before it occurs again. Earth's escape speed is 11 km/s. To leave Earth and not return, your rocket will have to reach a speed of at least 11 km/s shortly after takeoff. Once your rocket's fuel is exhausted, your orbit around the Sun will take you to Mars. Depending on your particular orbit, it can take from 130 to 330 days to reach Mars. For NASA's Mars missions, the average travel time is approximately 225 days, or about eight months. This is a long time, so you should definitely pack snacks and movies. The Mayflower took just over two months to cross the Atlantic. The journey to Mars is about four times longer than the Pilgrims' journey. In this simulation, you can launch a rocket to Mars and measure its travel time. The simulation starts with accurate positions and velocities of the planets as of Aug. 29, 2015. Click the scene to start. In this case, the travel time is 211 days, with the astronauts traveling from Dec. 22, 2015 to July 20, 2016. In The Martian, author Andy Weir describes how the Hermes spaceship uses an ion engine to provide a small impulse on the way to Mars, thus decreasing the total travel time. Weir wrote simulations like this to determine an accurate travel time for the Hermes. Introductory physics students can also write physically correct simulations. I suggest the book Matter and Interactions and the programming language VPython or GlowScript to learn how to create simulations of orbits and rockets.